2005 has been an odd year so far on the weather front with temperatures going up and down like a YO-YO, believe it or not this can effect fungi. With such a dry start to the year I must admit I was just a little concerned on how the fungi would react to the conditions. Some authors of the fungal fraternity theorise that a wet spring is good for the autumn flush, this may be true to some extent but when you get the downpours that took place during august in particular, the ‘fungi trigger’ is most definitely pulled. My year began in earnest during May, when for the first time in 10 years or so, I decided to lead a few spring forays. The first on Hampstead Heath 7th May was very good for the time of year and we’d had a bit of rain. St George’s mushroom’s (Calocybe gambosa) were already in full swing, the first appearing on 1st April, a month or so ahead of schedule. One big surprise was a splendid fruiting of the edible polypore, Laetiporus sulphureus (Chicken of the Woods), I have never seen it this early before, in fact throughout the whole month of May this fungus was fruiting right across the heath, could this be down to climate change?? Polyporus squasmosa (Dryads Saddle) was present also, yet no so uncommon at that time of year. The rare Entoloma aprile now recorded for 5 years in a row, was doing its utmost to maintain its spot in a small elm copse on the Heath. Unfortunatly that was the best of the spring forays as things turned really dry and as a result subsequent forays turned up very little, early fruitings of Paxillus involutus were noted on private walks but little else. 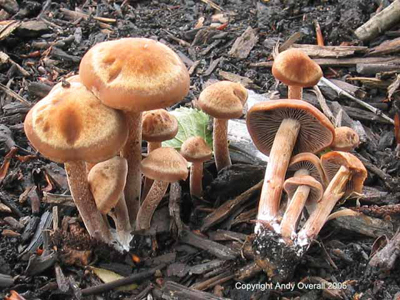 And then came a little rain……..
On woodchip/mulch in Golders Hill Park, huge fruitings of the uncommon Panaeolus cinctulus were sprouting up all over the place, along with the relatively early appearance of Stropharia aurantiaca, a beautiful, bright orange-red, alien species from New Zealand and the America’s. Volvariella gloiocephala had been fruiting here since May. Following some rain in early July a few Russula species emerged, R.parazurea and R. atropurpurea, along with the first Amanita fulva . And then it all went quiet again, as the summer re-emerged and dried things up a little. During this time I was leading forays and taking workshops, managing to find bits and bobs here and there to maintain the interest of those attending, a well as my own interest. A trip to Finland was ‘squeezed in’ between the forays and workshops and my eyes popped wide open!! Finland has a small window of ‘fungi oppurtunity’ during August-Sept, before it freezes over, and they most certainly seize the moment. During my 10 day stay, I saw and collected many species that I had not encountered in Britain such as Boletus pinophilus, Leccinum aurantiacum , Russula decolorans, Gomphideus glutinus, Cortinarius speciomissimus, Cortinarius brunneus, Amanita virosa, Lentinus lepideus, Hydnellum caeruleum, a stunning blue-purple hedgehog fungus, and more familiar species such as Cantherellus cibarius (Chanterelle), Russula vesca, Russula aureginea, R, xerampelina, Lactarius rufus, lactarius helvus and Lactarius tormentosus, among many others. It was a very worthwhile visit and highly recommended should you get the chance, we were in the lake and forest region, 300 or so KM North of Tampere. Upon my return to the UK, things were very dry, and a foray upon Hampstead Heath, 13th August, revealed very little, namely, Keuhneromyces mutablis, Psathyrella pilluliformis and Lacrymaria lacrybunda (Weeping Widow). But over subsequent weeks, the rain became more frequent and combined with very warm periods, provided ideal conditions for fungi to fruit. The best of these was Boletus appendiculatus, recorded by me, from the heath,(19th Aug) for the very first time, this is an uncommon to rare species, especially around the London area, even though it does favour, like many Boletes, warmer regions or spots. The wet and warm conditions also spurned Russula grisea to fruit on the Heath ext. and in many other areas, copious amounts of Hypholoma fasciculare (Sulphur Tuft). During a workshop foray, large clusters of Armillaria tabescens, (Ringless Honey Fungus) were discovered down by the fishing ponds, the Highgate end of Hampstead Heath, around a large, dead looking, Willow tree, during a private walk, the smallish Bolete, Gyroporus castaneus was also recorded and collected. And so, that brings us up to date for the time being, following the dry periods earlier this year, the rains of July-August look to have put things back on track, for what may prove to be a very good autumn season of fungi. Well, we are now at the end of September and despite a fairly dry 1st half to the month, it has been quite fruitful, especially toward the latter part of September when Boletus edulis The Cep began to appear. An early trip to the New Forest on Sept 18th was very disappointing with only a smattering of Chanterelles and Boletes and precious little else, it was very dry, it obviously hadn’t got the rain that we had in the South East. Fistulina hepatica, The Beefsteak Fungus, began to fruit during September this year, which is about the right time. Puttenham Common 25th Sept, was the highlight of the month’s forays with over 70 species recorded in 4 hours, these included Cantharellus cibarius Chantarelle in healthy numbers, the toxic milk cap Lactarius helvus, an uncommon and infrequent species, Coprinus acuminatus, a common ink cap look-alike with a prominent dark umbo (bump) on the cap, Cordyceps ophioglossoides, a weird club-shaped fungus that is parasitic on the subterranean fungus Elophomyces granulatus. Boletus edulis was present as were various species of scaber stalk boletes such as Leccinum scabrum, Brown Birch Bolete, Leccinum varicolor, Leccinum brunneogriseolum and one that remains to be identified. Russula species were very much in evidence, with R.vesca, R. claroflava, R. Ochroleuca, R. gracillima and R. atropurpurea among others, and various species of Cortinarius were also on display, most of which are still in the ID stage. It’s not all over for me when I leave the foray site, I get back home and put together a species list of those found on the day for the particular governing body of the site visited, for myself and for those who attend the foray if they so wish, some species prove quite difficult and need microscopic examination, in the case of Puttenham there were a handful that needed this work done on them. A nice find for me on the 29th Sept, which won’t bother you mycophiles out there, was Coprinellus auricomus an ink cap with a most wonderfully rich red-brown cap that has tiny hairs (x10 handlens) on it, seen clearer under the microscope, a new record for Hampstead Heath and myself, even though it was growing in Golders Hill Park on woodchip. Nov 26th and the main flush is all but over, my walks and workshops have come to an end for another year. Despite the hard frosts of recent weeks there are still a smattering of things about such as Mycena pura, Clitocybe nebularis, Macrolepiota rhacodes and various species of Lepista. A strange year, weather and fungi wise, but then when isn’t it? Some areas of the country that I visited were very disappointing, including one of the worse year’s I can remember for fungi in the New Forest, three trips during Sept and Oct turned up very little of note, compared to last year it was awful. Rain didn’t seem to arrive in South Hants until late October, whilst it poured down at times in the London area and as a result we saw more fungi. 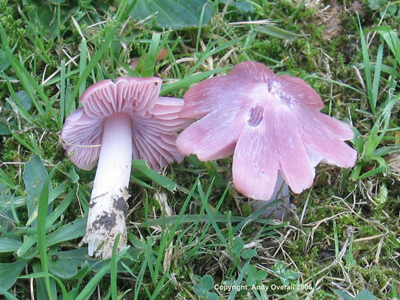 One of the highlights of the year has to be the recording of Hygrocybe calyptriformis, The Pink Wax Cap, from Kensal Green Cemetery for the first time on 4th Nov. This is a species included on the GLA Biodiversity Action Plan as red data listed and a species of conservation concern as it is across the UK. 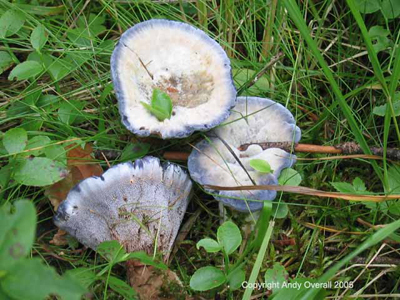 There has been a recent campaign for this species, among other grassland fungi, spearheaded by Shelley Evans, Conservation Officer for the BMS, as it is a symbolic species of unimproved chalk or acid grassland and very rare in some areas of the UK. This record from KGC is the second only record from Middlesex. As well as H. calyptriformis from KGC, there were 8 other species of Hygrocybe (Wax Caps) present, including H. ceracea, H, glutinipes, H, irrigata, H, conica var. conica, H, psittacina, H, quieta, H, pratensis and H, virginea var. virginea. According to the CHEG (Clavariaceae, Hygrocybe, Entoloma and Geoglossum) criteria for acid/chalk grassland, this puts the 9 species in one visit, within the catagorie of ‘regionally important’ . To go one better than that and to have the only record in Middlesex, (Hampstead Heath) of Volvariella surrecta, The Piggy Back Rosegill, on Nov 5th, was a rare treat. There are in fact only 46 records of this species in the whole of the UK and it is not included as Red Data Listed or as a BAP concern, maybe not enough information is known about its ecology to be able to assign it any status, but the fact that there are only 46 records in the UK and 1 in Middlesex should qualify it for some recognition? Volvariella surrecta fruits on the decaying fruitbodies of mainly Clitocybe nebularis, The Clouded Agaric, of which each year, toward the end of the autumn, is very abundant in all areas in which I foray. 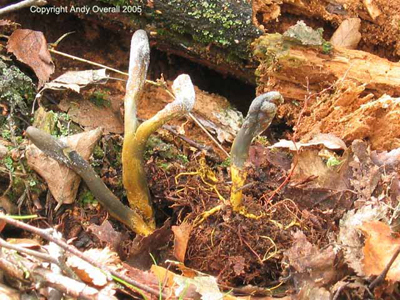 So the fact that Volvariella surrecta has never been recorded from Middlesex before, must prove that it is very specialised in which fruitbodies it chooses to utilise, yet on the other hand, if we are to follow DNA and Molecular trends, it may not need to fruit, due to the success of the mycelium, due to a never ending supply of the Clouded Agaric? so is it rare or very common? Mmmm. Whatever, it is rare to see it fruiting and much like other species of Volvariella it emerges from a universal veil, like that of the Amanita family and like the Death Cap and Destroying Angel, the base is surrounded by a loose volval sac, some 10cm tall and which is fairly membranous. It is a small to medium sized species, white with pinkish gills and spore print. 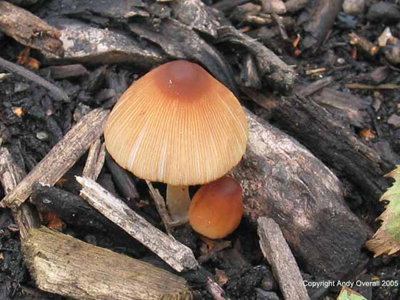 It fruits on the cap or from around the base of the decaying Clouded Agarics, so look out for it. Just in case the Amanita reference causes confusion, Amanita species have white gills and spore print. To end unfortunatly on a more sour note, those of you that enjoyed foraying with me at Wimbledon Common, will no longer be able to do so, as the conservators of Wimbledon Common, have in their infinite wisdom, decided to stop all further fungi forays on the common. 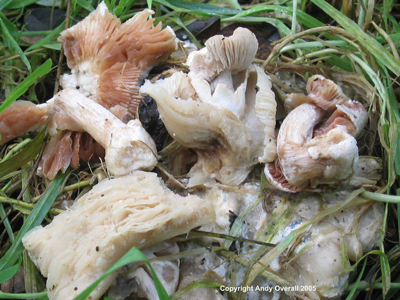 This comes as a result of years of fungi harvesting from the Common, by those who pick to sell to restaurants and other outlets. 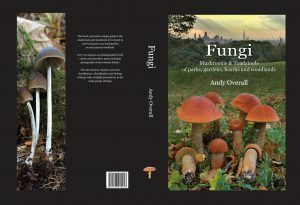 Our fungi forays along with others that have taken place over the years, have been judged as being, in some way instrumental in ‘Tipping People Off’ to where they can pick edible fungi on the Common. I have written to the conservators appealing this decision and still await their reply. Fungi Reuters….. Following a meeting with the conservators in December, the rangers of Wimbledon Common managed to turn this decision around and it looks as if we will be able to foray on the Common in 2006, albeit with some compromise. Only 12 people will be allowed on each foray. At least the forays can keep going ahead, which is the important thing. Maybe in time to come we can have few more people on the forays.